5/1 Cup of Coffee: Pawtucket cruised to a victory on a stellar performance on the mound from Steven Wright (pictured, left), who did not allow a run in seven innings. Salem and Greenville, meanwhile, could not hold on to leads and failed to take advantage of runners in scoring position. Portland had the day off. Knuckleballer Steven Wright had his best game of the year in a Thursday matinee, shutting out Syracuse over seven innings. Wright allowed only four hits, struck out seven and walked two to earn the win. His only trouble of the outing was a one-out, bases-loaded jam in the top of the fifth, but he was able to induce an inning-ending double play. Zeke Spruill capped the shutout with two innings of scoreless relief, striking out a pair. Travis Shaw got the offense rolling early with his first home run of the year, a solo shot in the bottom of the first. Shaw went 1 for 3 with a run scored and two RBI. Deven Marrero added his second home run of the year in the fifth inning on a solo shot. Blake Swihart went 1 for 2 with a pair of walks. It was a frustrating night for Salem, as they could not hold neither four-run lead nor a three-run lead. Salem burned up the basepaths with a whopping eight stolen bases on the game. Three of those steals came from center fielder Cole Sturgeon. Manuel Margot nabbed his ninth base of the young season, and scored three times in the game. Aneury Tavarez, Jose Vinicio, Wendell Rijo and Jake Romanski also swiped a basea piece. Right fielder Franklin Guzman added his first home run of the season. The Red Sox went just 3 for 12 with runners in scoring position. Teddy Stankiewicz was cruising along on the mound until the wheels suddenly came off in the sixth inning. Stankiewicz was an out away from getting out of the sixth when he hit a batter, walked the next two, then gave up a game-tying, bases-clearing double. Salem re-took the lead in the sixth, but Frederick scored three in the top of the ninth off of relievers Taylor Grover and Austin Maddox, who took the loss. A Frederick pitcher was taken to the hospital after being struck in the head on by a line drive off of the bat of Jordan Betts, according to WDBJ. Greenville also could not hold onto a lead on Thursday and came up short in the ninth when they brought the winning run to the plate. Jeffry Fernandez did not escape the fifth, surrendering a go-ahead three-run home run. It was a rough night for him, giving up nine hits in 4 2/3 innings, and was charged with six earned runs. Aaron Wilkerson kept Greenville in striking distance with 3 1/3 innings of scoreless relief, striking out three. Catcher Jordan Procyshen had a big night at the plate, going 2 for 3 with his first home run of the season, two RBI, two walks and two runs scored. Greenville left eight men on base and went 2 for 12 with runners in scoring position. Procyshen cut the Kannapolis lead to one in the ninth, bringing Nick Longhi to the plate representing the winning run, but he grounded out to end the game. 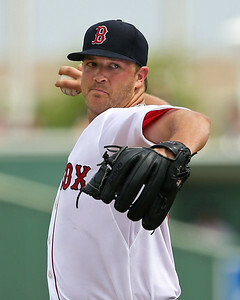 Player of the Night: Steven Wright showed how effective the knuckleball can be in his dominant victory. Wright lowered his ERA from 6.55 to 4.00 in his third start for Pawtucket. He also now has 19 strikeouts in 18 innings pitched at the AAA level.